This year at Christmas we created Nativity characters made from paper mache eggs and Quikwood. If you want to see them you can go here – Egg Nativity. They were fun to create and we added a hook at the top that could be used as a hanger or a place card holder. On that post I also had step-by-step videos. As I was packing them up I thought this same concept could make some great snow people…and so I started playing. If you are not familiar with what you will need here are the basics – 2 1/2 ” paper mache egg, Quikwood, DecoArt extender and Avon Care Silicone Glove. You don’t absolutely need the Silicone Glove but it makes it so much easier to work with the Quikwood. Apply it before starting and add a little more as you continue working. Lets get started. To make the feet cut about 3/8″ of Quikwood and mix it together. Quikwood is a two part resin, when you mix it together it will harden in about 15 minutes. If you do not completely mix it together it will not harden. It is good to work on parchment paper, wax paper or a paper palette. Divide your clay in two and roll into ovals. Position them together and then place your egg with wide side down on top, making sure it is straight. If you would like your snow person to be wearing boots, let the feet harden. Then cut another 3/8″ of quick wood and shape into two cylinders. Place each on top of the feet and use Extender to blend them to the foot. If needed, use a knife to place crease between the boots. Sit egg on top making sure it is straight. If you want a hanger cut about 9″ of 20 gauge wire. Make a loop on the bottom and then bend at a right angle. Cut a sliver of Quikwood and attach 1/2 to top of egg, then sit loop end in it. Using the other piece of clay, make a small coil and lay around wire. Blend into egg using extender. You might have to prop it up since the wire makes it top heavy. Allow to dry. For the head cut about an inch of Quikwood and roll into a ball. Slip the ball down over the wire and position in place. If needed pat a little to reshape the head. Cut about 3/4″ – 1″ off of the pointy end of a toothpick and push into the center of the head for a nose. To make the hat brim flatten a sliver of Qwikwood into a circle a little larger than their head – about 1″ – 1 1/4″. Place a small hole in the center. Allow to lay flat until almost set, then slip over wire onto the top of the head. Keep checking and position the brim the way you would like it. Using a sliver of Quikwood, make either a round or cylinder shape for the top of the hat. Slip down wire. For my girl I wanted to place a feather in her hat so I positioned it into place and then removed it. I will glue into place when done. For the arms cut 1/2″ of Quikwood, divide in two and roll into a cone about 1 1/2″ – 1 3/4″ long. For my girl I laid the clay in place on the egg. I wanted her to hold a tree so I positioned it in place and removed it. Since I wanted him to be holding a banner, I put a notch in each hand and then bent the arms. I allow these arms to set until they were getting firm – about 10 – 15 minutes. I then attached them to the body (use a few drops of Super Glue Gel if needed). I keep checking them and bending them until they were set. I forgot to take a picture but I added Quikwood buttons on the guy. To make the hanger fold over the wire about 3/4″ above the top of the figure. To get a nice round shape wrap around the top of the extender bottle, then shape with your hands. Clip off excess wire. Now the fun part – painting and completing. I used DecoArt paints for the project. Base everything Snow White, and then add the details in the colors of choice. I used Spice Pumpkin for the nose, Soft Black for the features and his hat, Sapphire thinned down one side and across the bottom of the buttons, and Tomato Red for the boots, her hat and their cheeks. I used Emperors Gold for the hat bands and buckles on his boots. Once done I spray varnished. I then use DecoArt Walnut antiquing. When dry I used white glue and craft glitter on them. I put glitter on thier bodies, top and brim of hats and toes of boots. Everyone needs a little sparkle. Once dry I added the doodads. I glued the feather and tree into place and added a rhinestone in front of the feather. I tied a rayon ribbon bow around her neck. I added a thicker bakers twine for his scarf. To make his banner I used a piece of twine and folder three pieces of washi tape over it to make the banners. I then trimmed them into desired shape. I glued the ends onto the hands. I’m in love with them. They could be wonderful placeholders for a sweetheart banquet. And remember those glitter houses we did here- Making Glitter Houses, and here – Glass Glitter Houses and here – Music Glitter House they would look great with them. I would just not put the hook on them. 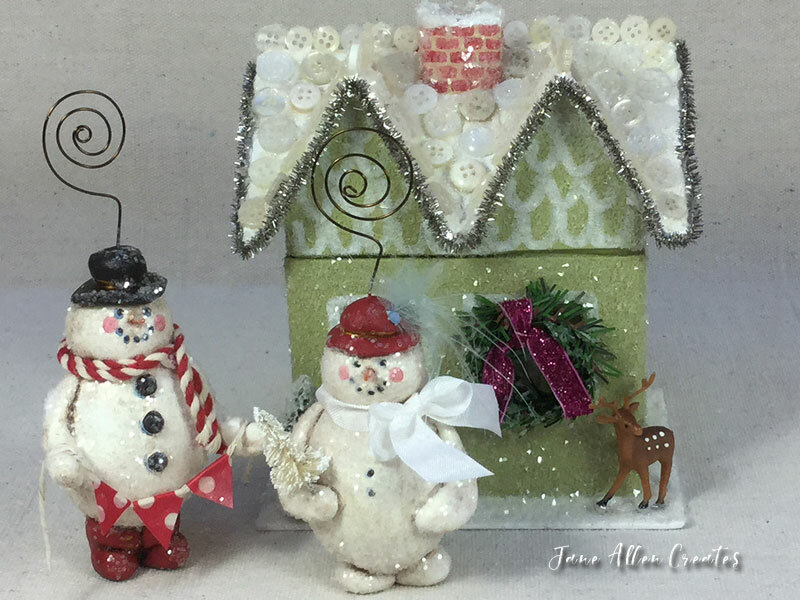 I am already seeing a tablescape for next Christmas with glitter houses and these snowies. Never too early to get started. I hope you will enjoy creating these. It is a great project for a cold winter day. PS. I am seeing so many possibilities with these, holding skis, wearing ice skates, chief’s hat, tutu, and on and on. What are you seeing? Adorable, Jane. Love them. I will put them on my list of to do once my hand heals! Thank you Kim, they are easy to create. Very clever and creative! Love these! Thank you, I hope you have fun creating them. Well, I do not make up the rules, but I do try to follow them. This rule is: whenever you send someone a shepherd, you MUST also send them a snowman! Bwah ha ha ha…. Those are absolutely adorable! My goodness, you stay busy. My favorite is in front of the green house –oh, My! I am painting bunnies, so you are way ahead of the game. Thanks for sharing the smiles! Thank you Charlotte you always make me smile. I think you are ahead of the game because bunnies are still in my head and not on my design table. Thank you for all your encouragement my friend! Wow! You out did yourself. They are precious. I just love them. You are so talented. Thank you for sharing .you are so generous. May God Bless you. Thank you Agnes, so glad that you enjoy them. OH,NO! I have to order more eggs. These are just toooooo cute.FYI Consumer crafts have the eggs 6 for under $2.00 and a whole lot more paper mache products..
Mary Elizabeth, glad that you are enjoying the egg projects. You are making me smile. I will have to check out consumer crafts other products. Thanks for the tip. Love, love, love your snowies! Is that Avon Silicone Glove just for your hands or you mix it with the Quick wood? Terri it is for your hands. Without it we use to get a build up of quikwood on our hands. We have tried other products but this works great. It makes it so much easier to create. If you don’t have an Avon lady, you can get it on Amazon. Jane, these are fantastic and I can’t wait to try them out. I’ve never done a project like this and I’m excited to use a new medium. Thank you Lisa, quikwood just opens the door to so many creative possibilities, I just love it and hope you do too. Thank you Lynn, you are clever not only with art but also words. You are very welcome Barbara, enjoy! I love these!! I can see a chubby gingerbread boy and a Santa! Thank you Wendy, I didn’t think about the gingerbread – good idea. They could be so fun with a gingerbread house. I did think about the Santa’s and am planning a few for next year. Another adorable idea Jane! Thanks for sharing! Thank you Sandy, a set for Valentine’s Day would look cute with your house. I have to work on mine. Wish you lived closer we could have a lot of fun creating together! Love your snow babies, so many possibilities. I love your snow people, they look wonderful with the glitter houses. Especially the one with the red and white scarf holding the bunting! Beautiful work!! Jane, I love these little guys. The green glitter house is super cute too. They made me smile.